New York City Family: Is It Too Early to Teach My Baby Three Languages? Is It Too Early to Teach My Baby Three Languages? As parents, we all have our "things." One of Rob's thing for Greyson is to be musical and one of my things for Greyson is to be multilingual. My first language was Korean, then English (at age 4-ish when we moved to the States from Seoul), then I took three years of French in high school and I've been learning Brasilian Portuguese for the past five years. I love how language opens your ears, opens your mind to other cultures and opens up the world to you. When you first understand or tell a funny story in another language other than your native tongue, it feels amazing! It feels like unlocking a world, just using sounds, which are available to all of us! I spoke Korean exclusively until I was around 4 years old, at which point I was taught English, which is what we spoke at home. Over the years, I didn't pay much attention to Korean, but I went to Korean schools on weekends on and off for years and my parents sent me to a Korean language program in Seoul after finishing high school, so the language was always there in the background. My understanding of the language is probably just barely at the advanced intermediate line, but speaking is harder for me. What I'm glad about, though, is that I have a foundation in the language and a comfort with the language because it's always been around me. Since I have that, I don't feel intimidated by the language and picking it up. Here's audio of me talking to and singing to my Dad in Korean and English when I was 5. And here's me singing to my baby in Korean, Brazilian Portuguese and English! Aren't I going to confuse my baby with so many languages?? I address that topic after the jump. Greyson has inspired me to pick up Korean again since I want him to learn it. I also want to teach him Portuguese! It's not so much that I so want him to speak Portuguese, per se, but I love that language, so it's going to be more fun to teach than, say, Spanish, which may be more useful, but I don't know it (yet). It's like that phrase, "the best camera is the one you have with you." I have the Portuguese! Also, for me, it's more about Greyson developing an interest in and comfort with languages in general, not necessarily becoming fluent in Portuguese and Korean. People who aren't familiar with a child's ability to soak up languages at an early age often say that learning multiple languages is confusing. I don't feel that way because I am the product of learning two languages at an early age, and so is my brother. I recently heard that audio recording of me talking to my dad in Korean and English when I was 5 years old, a year after learning English. I was effortlessly going back and forth between both languages. I'm not saying it's going to be easy or that I even know how to teach Greyson three languages (one seems hard enough), but my plan is to be consistent and use every opportunity available to expose Greyson to all three languages. We'll see what happens! So, how have I been executing this mission so far? Whenever I can, I'll often say the thing in all three languages all in the same way. So, if I want a kiss from Greyson, I'll say...Give me a kiss! Ppo Ppo joo say yo! Me dá um beijo! Besides sprinkling words and phrases here and there throughout the day, I also dedicate his meal times to either Korean or Portuguese and switch. Sometimes (often) I resort to English if I don't know the word in one of the languages (I couldn't for the life of me remember what the word for carrot was in Korean today). And other than that, I try to play Korean or Brasilian music in the background and when we watch videos online, I try to make it Korean or Portuguese. Will this approach work? I don't know! I just try to give Greyson some Korean and some Portuguese daily and hope some of it sticks over time. -A Korean language here and another online resource page here. -Greyson's Tia Ana, of my Brasilian family in Minas Gerais, has sent me children's music, which I play daily (see picture below). Greyson loves the song O Pato on the Arca de Noé CD. An online kids channel with tons of stories, songs, games, etc. -Also, I realized that Sonia-Portugese, another Portuguese site I've liked and used for a long time, has a kids section! -Multi-language sites like Everyday Language Learner have great resource pages for individual languages. Technology has made language learning so easy, too. There are so many resources. You have to do some digging to find the right ones, but there is so much stuff online for any language you want to learn. For both Korean and Portuguese I've Googled up a storm and found some language apps and kids songs and shows on YouTube. Also, there are many parents who blog and share their experiences and resources for teaching their babies Korean, Portuguese and other languages. One site leads to another. For instance, this site called Bringing up Baby Bilingual had a ton of other multilingual-related links on its sidebar. Also, Facebook just started translating some posts, so when I see a post from a Brasilian friend or Brasilian news outlet in Portuguese on my Facebook, I can read the text and see if I understand it and then click "translate" to check myself against it. There's also websites like Lingro (love! ), that can make any webpage like a dictionary so you can read in another language and click on any word to quickly see what it means in your native tongue (also the Lingro bar you can download for free is awesome). I could go on...there's seriously so much out there. I'm just starting out on this adventure. There's no fixed plan or structure to this yet...but hopefully, it's one of those things that you figure out as you go along, trial and error style. If you have any tips you'd like to share for introducing languages to babies, I'm all ears! Obrigada! Gamsa-hamnida! Thank you! I'll sign off with a video of Greyson when he was two months old. We stumbled upon Raizes do Brasil practicing Capoeira in Prospect Park. 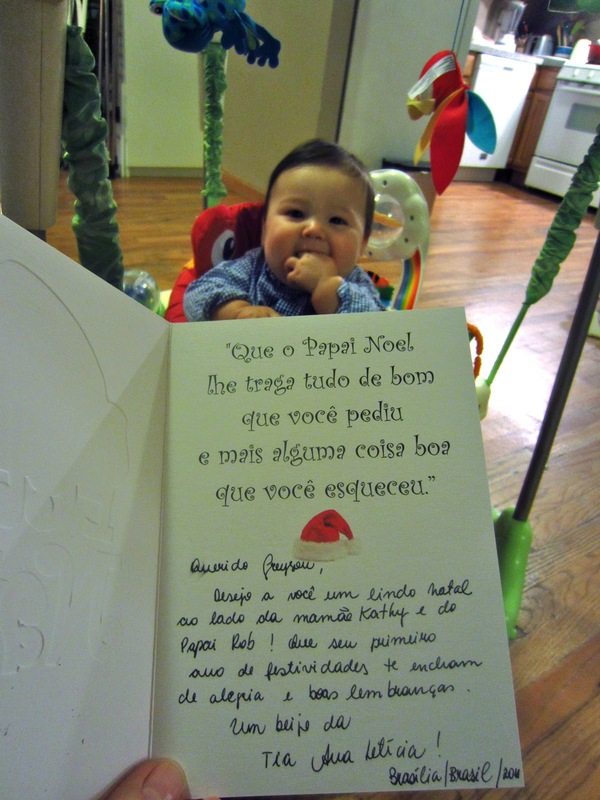 Greyson's introduction to Brasilian music and culture started very early on in his life! Raising a bilingual or multilingual kid is challenging, but there are many advantages to growing bilingual. Unfortunately schools in general are not prepared to handle the differences in learning and sometimes teachers give a hard time to parents of bilingual kids. Here is a good article about the advantages of growing bilingual. Acabei de ler o artigo...que interessante. I agree that the opportunity to be bilingual is a potential gift, not a bad thing at all. It's sad that any schools would discourage bilingualism. I think a lot of people don't get it. See you on Street Smart Brazil! This is so cool! I would love for Sydney to be multilingual, but unfortunately, her parents aren't :) We are trying to get her talking with my sister, who lives in China and speaks fluent Mandarin, as much as possible, but I should look into some of the language resources you have here. Thanks, Anne! I wonder, though, if any exposure to other languages is good exposure. I discovered a blog, FluentIn3Months.com, and the guy talks about how most of us know a lot more than we think, but we find reasons not to use what we know. That definitely applies to me...I never use Korean at Korean delis or laundry places because I'm really shy about it. But just the other day, Rob and I went to a Cuban sandwich place and I was like, I'm going to speak in Spanish. I've never learned any Spanish, but I knew enough to say, Ohla...quiero uno cubano! The guy was super nice and spoke back to me in Spanish and was like, algo mas? I said, no, gracias. It was fun! So, I decided I'm going to try and speak Spanish when the store owners are Spanish and Korean when they're Korean, etc. I got a bagel today and said, quiero uno bagel por favor...con butter. And he goes, oh, mategaya (or however you spell it) and he asked tostado? And I said, si, tostado! Even though I speak no spanish, using the little I know, I learned that butter is mantegaya. And I like that Greyson heard that "conversation." My goal isn't to get him to be fluent, but to be appreciate and be comfortable around languages and think of it as a fun thing. Olá, Kathy! Eu sou professora de português e adorei a sua história e o seu blog. Eu acho que o Greyson tem muita sorte de ter uma mãe empenhada em fazê-lo aprender três línguas desde bebê! Acho que pode ser útil pra você. Oi Lia! Obrigado pelo link e seu apoio. O site é bem útil! Um outro aspecto que também é importante é que para aprender uma língua, a criança precisa de estímulos, de modelos e de um ambiente linguisticamente rico. Os pais devem conversar bastante e naturalmente com seus filhos, devem valorizar suas iniciativas de comunicação, devem ensinar novas palavras, devem brincar, ler muitas histórias, cantar, ver filmes, enfim devem valorizar a comunicação de uma forma ampla e prazerosa. I was gaming with a bunch of kids from Singapore, and I asked them how many languages they speak there. One said, "Seven!" "Wow! You're so lucky!" I replied. "But, we don't speak any of them good [well]!" he complained. Thanks for you NYC bagel secrets. PLEASE PLEASE PLEASE divulge any Korean BBQ and/or kimchi! I would crave this at odd hours and make midnight drives into Flushing for a taste of Heaven. I just started reading your blogs today, very interesting and helpful. We are planning to have a family in NY, and going to teach the baby to be multilingual as well. A friend of mine, she is a linguist professor, she said it's very important to teach a mother language first before introducing other language. There's a case where a mom tried to teach her son 3 - 4 different languages at the same time, and the little boy sure can speak all 4 of them, but only in short phrases, he do not how to speak a complete sentence at age 3, ended up need to see professional speech/language therapy for over a year. I,myself is from Hong Kong, speaking Cantonese Chinese as mother language, started learning English around 2 in Kindergarten, grew up with a English speaking Nanny in HK, then came to US for middle school and High school. I started learning Mandarin Chinese when I started working in China, and then learned Korean with a 1 on 1 tutor when I was around 24 years old, and now my Korean is fluent enough for casual conversation and get around in Korea. I suggest you teach Greyson Korean first, then have one parent speaking only Portuguese at home after 3 years old, ( like how I had my English speaking nanny), he will only learn and speak English at school, and outside of home.